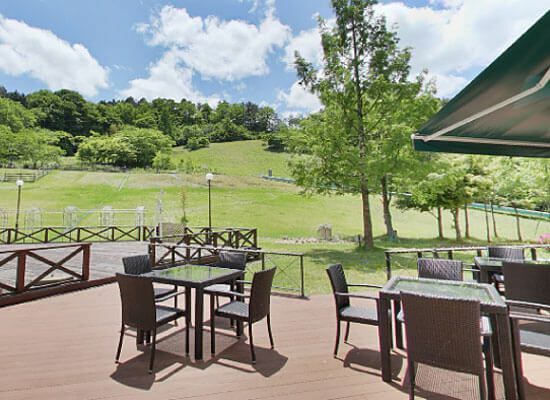 Located in the mountains of Kannabe highlands and surrounded by a rich amount of nature, Blue Ridge Hotel’s buffet and hot springs are open to the public. Stop by for a delicious meal or a relaxing soak after exploring the surrounding nature trails, hiking the old volcano and other outdoor activities. 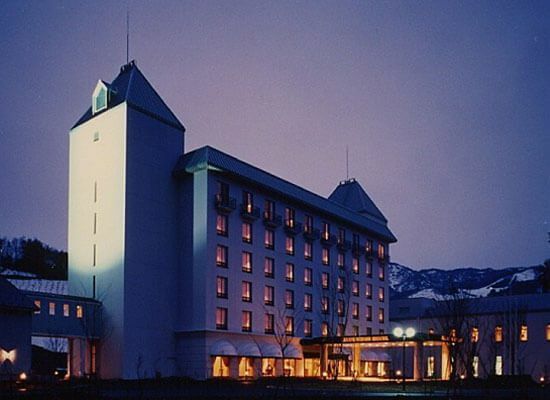 There are three ski resorts near the hotel, Up Kannabe Ski Resort, Oku-kannabe and Manba ski areas. Enjoy seasonally inspired dishes made with local ingredients. 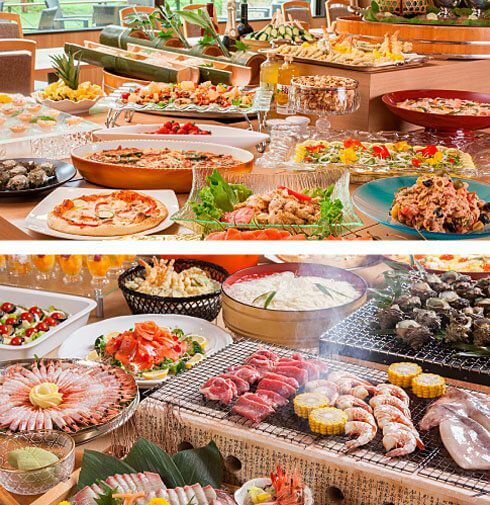 The buffets are based on what is available during the current season so the menu tends to change several times throughout the year. 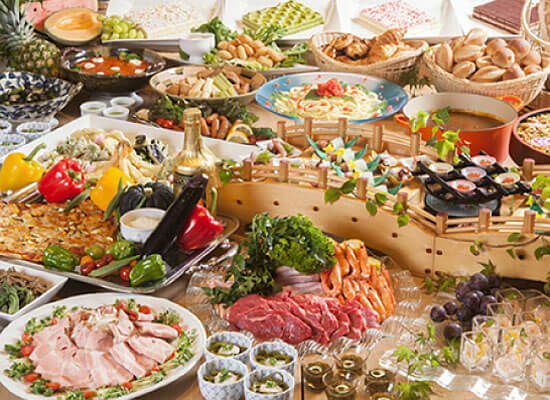 This is an all-you-can-eat smorgasbord where you can keep refilling your plate until you have eaten your fill. In the spring you will find such dishes as sweet shrimp, crab pilaf, squid, and other seasonal seafood and vegetable dishes. In the summer, seasonal dishes tend to lean towards the grilled type and in the winter you are sure to find an array of various crab dishes. 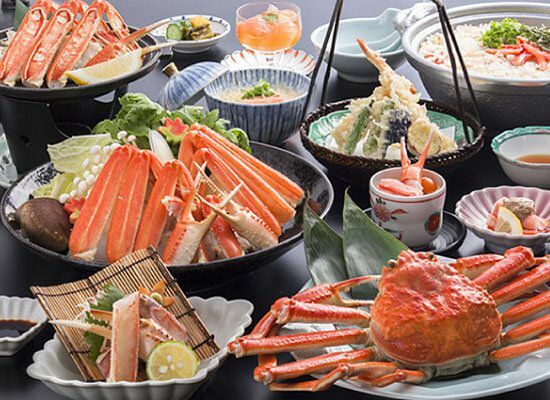 Year round you can find fresh seafood that has been caught in the nearby ports along the Sea of Japan, as well as Tajima beef, the local top brand name beef and origin of Kobe beef. Those not staying at the hotel are also welcome to dine at the buffet. Although reservations are not required they are highly recommended, as the restaurant fills up quickly for dinners. Reservations can be made by phone (reservations will be done in Japanese, unless the English speaking staff is available then they may be able to help). 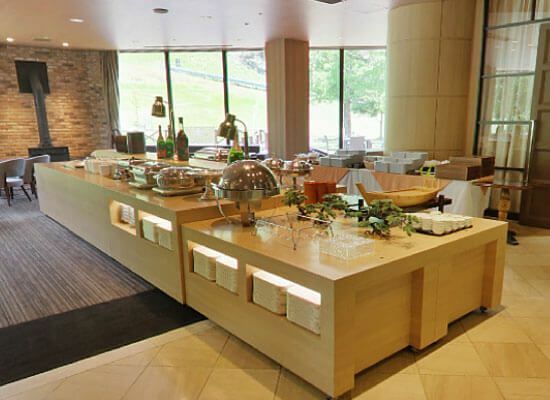 Something else to note is that the buffet does have a time limit and you can choose one of two time slots, each time slot lets you enjoy the buffet for an allotted 90 minutes. The times are from 5:30PM~(90min) or 7:30PM~(90min). 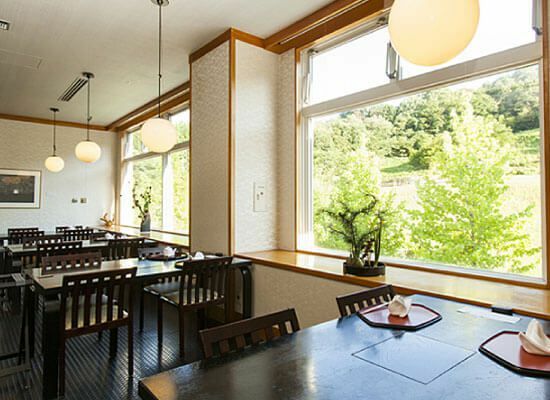 The Japanese style restaurant Kogen is located on the 2nd floor of Blue Ridge Hotel. 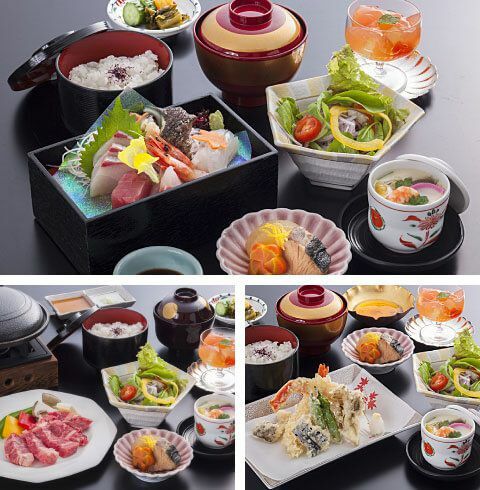 The menu features traditional Japanese cuisine like sashimi, tempura, shabu-shabu, nabe and more. For guests looking to partake one of their elaborate dinner courses known as Kaiseki Ryori, you will need to make reservations at least 3 days in advanced. You will also need to have a group of 2 or more to make the reservations. You can choose from one of their seasonal courses, crab is the lead main course in winter, or a year round course. Courses start from 3,500 yen and can go up to about 9,000 yen for the more luxurious options, like the Tajima Gyu Shabu-Shabu course. You can still sit down for lunch even without reservations and the menu is mainly set meals ranging in price from about 1,500 yen to 2,200 yen. Pictured above is a sample of one of their recommended lunch courses that includes 9 kinds of Japanese culinary delights, a rice based dish, soup, dessert and coffee for about 2,200 yen. Other sets are the Sashimi Set, Daily Special (the main dish and sides will change daily), grilled wagyu beef and tempura lunch set. 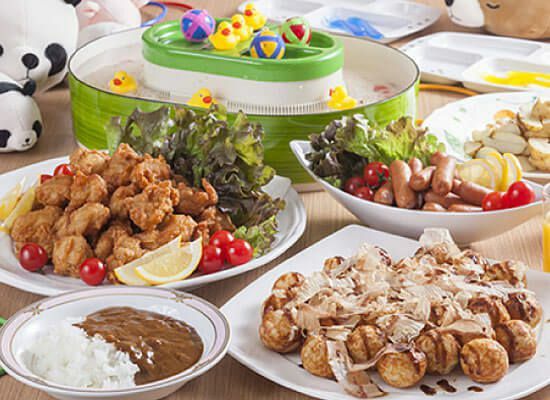 For guests traveling with children, there is also a children’s lunch menu to choose from. Aside from the restaurant, visitors are also welcome to soak in the hot springs. 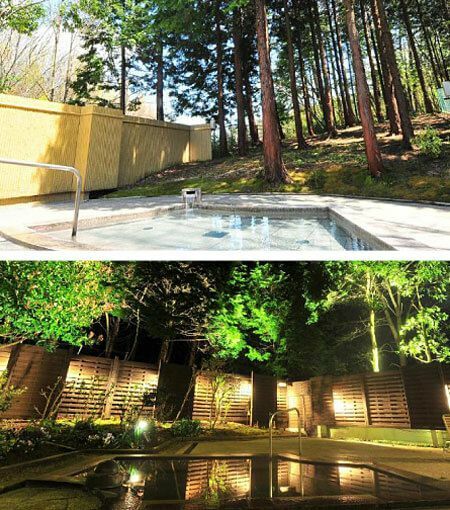 Enjoy the starry sky above you at night in the outdoor bath or the fresh mountain air during the day. The indoor spa has a large open public bath. The baths are open from 6AM to 9AM and 3PM to midnight. The sauna is open from 5PM to 11PM. 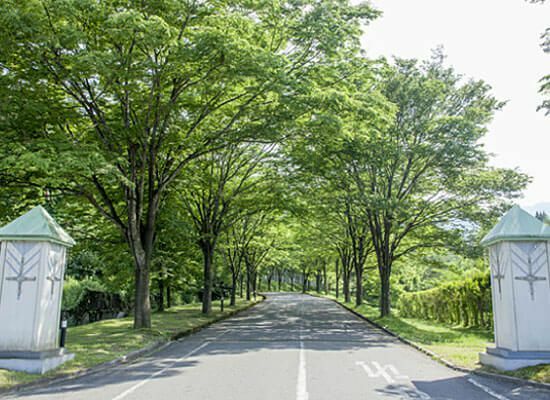 The water spring comes from the Kannabe volcano and contains high amounts of alkaline. This gives the waters beautifying features that leave your skin feeling smooth. 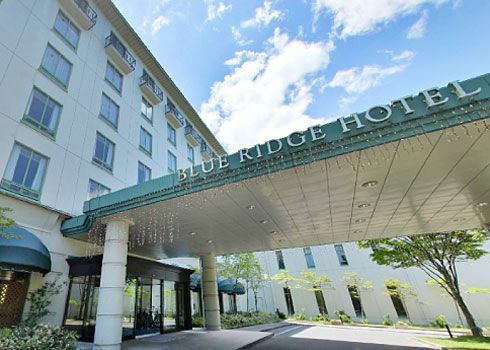 Entrance for the baths is 1,000 yen/adult and 500 yen/child and free for guests who are staying at Blue Ridge Hotel. Towels are not provided and you will need to bring your own. Crab kaiseki dinner. Reservations required. Winter only. Dinner is buffet style and the lunch menu is mainly lunch sets. There is also a children’s menu.